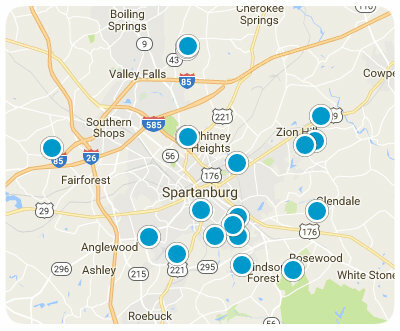 Located Spartanburg’s Westside and in District 6. This neighborhood was established in the early 2000’s and consists of one and two story homes. Residents enjoy mostly vinyl construction, but there are some with a mixture of brick and vinyl with most homes having double car garages. Small lot sizes below ½ an acre make lawn work less of a chore and give more time for your leisure activities. Home prices range from $100,000 to $200,000 and range from 1200 to 2400 square feet. An annual HOA fee of $130 covers the street lights and common areas. Enjoy living in this small neighborhood that is located just 10 minutes from local shopping, restaurants and schools, such as Anderson Mill, Dawkins and Dorman.